This tutorial describes how to view detailed information about connections between variables in your model using the view_connections function. The intent of view_connections is to help spot things like bad or missing unit conversions, connections to inputs that are either unintended or missing, or variables that have the wrong value. In many cases, the view_tree function, described in Visualizing OpenMDAO Model Structure and Connections may provide a faster way to spot missing or unintended connections. # popping up during our doc testing. outfile: The name of the html output file. This defaults to connections.html. show_browser: If True, pop up a webbrowser to view the file. Defaults to True. src_filter: The starting path used for the source filter. Defaults to ‘’, which will show all source variables. 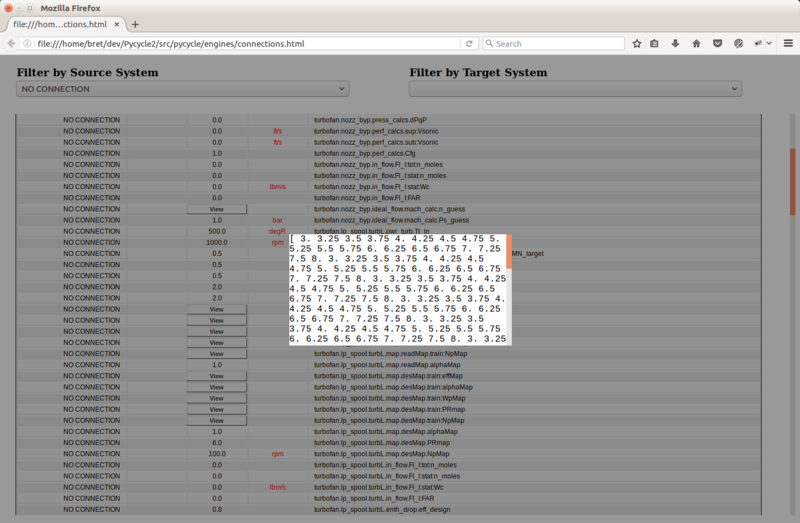 tgt_filter: The starting path used for the target filter. Defaults to ‘’, which will show all target variables. The html file generated by view_connections is self-contained, so it can be passed around to other people, but it does require network access in order to load the d3 library. Source variables are shown in the left column, followed by a column containing their units. The center column contains the value of the target variable. If the variable is an array or any other object with a string representation of more than 20 characters, the column entry is a View button that will pop up a very simple viewer for that variable when you click on it. The following figure shows what the viewer looks like. To make the viewer go away, just click anywhere in the area outside of it. The entries in the value column are displayed in the units of the target variable, except when looking at unconnected source variables. The value column is followed by the target units and finally the name of the target variable. Units are highlighted in red when the source unit differs from the target unit. 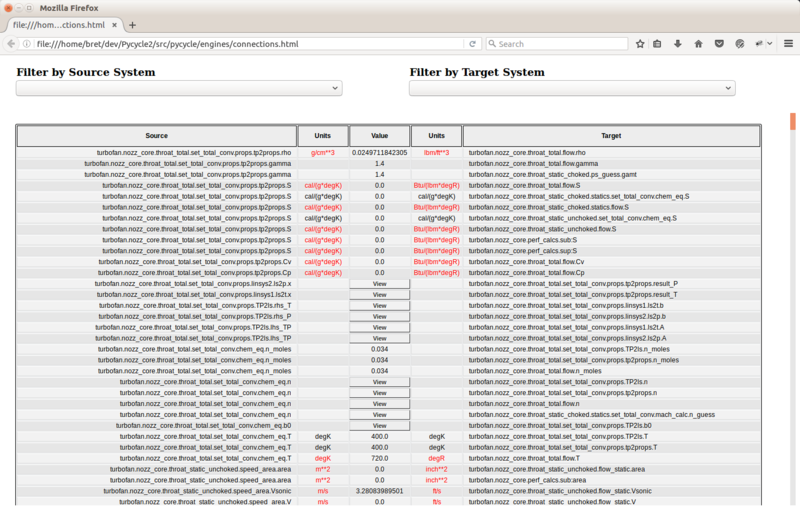 Here we show all unconnected inputs found on the turbofan.lp_spool.core.turbH.in_flow Component by specifying the Component name in the Filter by Target System field and NO CONNECTION in the Filter by Source System field.